Default Role For Social Login : In this option you will need to define default user role when people register using social login integration. 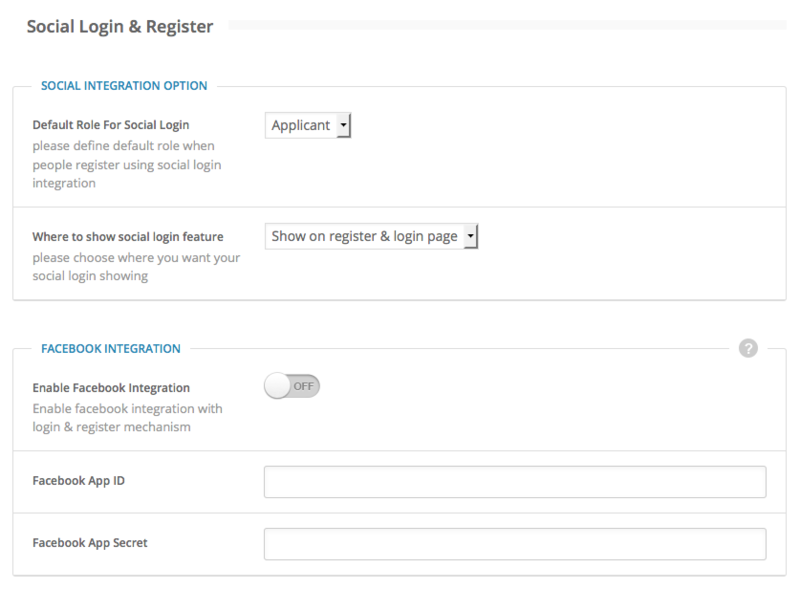 Where to Show Social Login Feature : In this option you will need to choose where your social login feature will be shown. Enable Facebook Integration : Enable this option if you want to use Facebook integration with login and registration. Facebook App ID : Insert your Facebook App ID. Facebook App Secret : Insert your Facebook App Secret. Register Facebook App If you don’t have a Facebook App account, you can register right here. Enable Google Integration : Enable this option if you want to use Google integration with login and registration. Google Client ID : Insert your Google Client ID. Google Secret : Insert your Google Secret. Google Apps Name : Insert your Google Apps Name. Before creating a developer account, log in to your Google account. Create a new project or use an existing project. Then select the project and choose Credentials → New Credentials → OAuth client ID. For Application Type choose “Web Application” and complete all input fields. Then click the Create button. You will then get your Client ID and Client Secret. 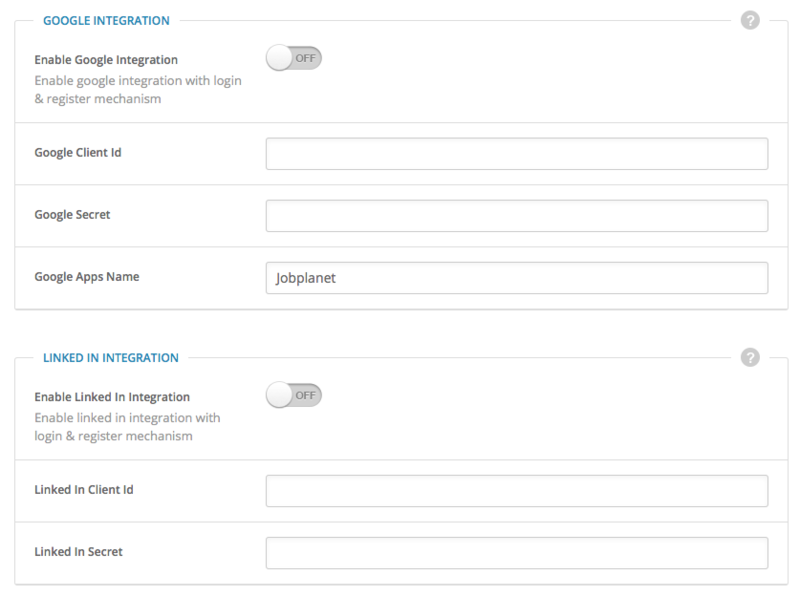 Enable LinkedIn Integration : Enable this option if you want to use LinkedIn integration with login and registration. LinkedIn Client ID : Insert your LinkedIn Client ID. LinkedIn Secret : Insert your LinkedIn Secret. Before creating a developer account, log in to your LinkedIn account. Create a new application (click Create Application button) or use an existing project. Complete all input fields and click the Submit button. Hide Admin Bar For Employer & Applicant : Enable this option if you want to hide the admin bar for all employers & applicants. Enable Captcha On Registration : Enable this option if you want to use captcha on registration in order to prevent spam.